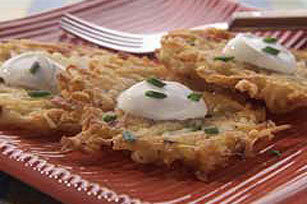 Potato Latkes are an appetizer right?? There are tons of different recipes for these out there! Peel the potatoes and shred them in a food processor fitted with the shredding blade; transfer the potatoes to a large bowl as the food processor fills up. Transfer the onion to the bowl with the potatoes and stir in the matzo meal, egg, baking powder and salt. Fill a large skillet with 1/2 inch oil. Heat over medium-high heat until the oil is very hot but not smoking. To test if the oil is hot enough, drop a small piece of potato into the oil; if the potato sizzles steadily, the oil is ready. Working in batches, scoop the potato mixture by 1/4-cupfuls and add them carefully to the skillet, flattening each latke slightly with a spatula. Fry, turning the latkes once, until golden brown and cooked through, about 3 minutes. Remove any loose bits of potato mixture between batches with a slotted spoon. Serve the latkes immediately, or keep them warm in a 200 degree F oven. Garnish with fresh herbs and serve with sour cream. I like to season my sour cream with a few dashes of paprika and throw in a few slices of chopped green onion.